Growing up the 4th of July was my favorite holiday. I loved the flags...the red, white and blue...the fireworks...the patriotism. I remember lighting fireworks in my grandparents driveway. It was so much good old fashioned fun! We cannot set off our own fireworks where we live. Most of the big firework display have been cancelled...or the fog covers them up anyway. So I have to create a little 4th of July magic myself. So...here is the inspiration...My daughter LOVES snowglobes. I buy them anytime I see them at thrift stores. 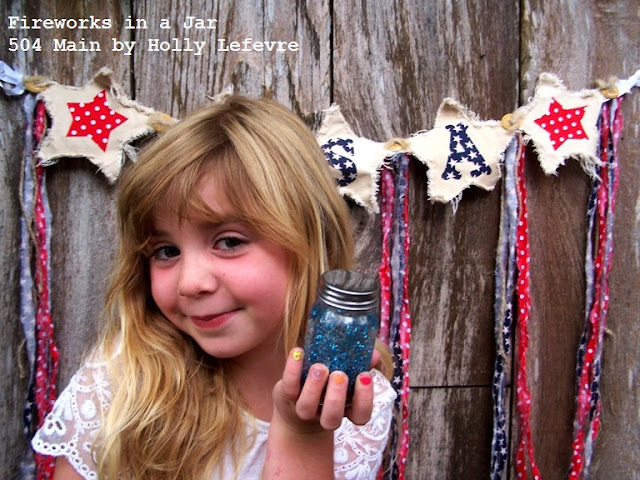 My daughter loves glitter (so do I)...so I have a feeling this project will be out year round. 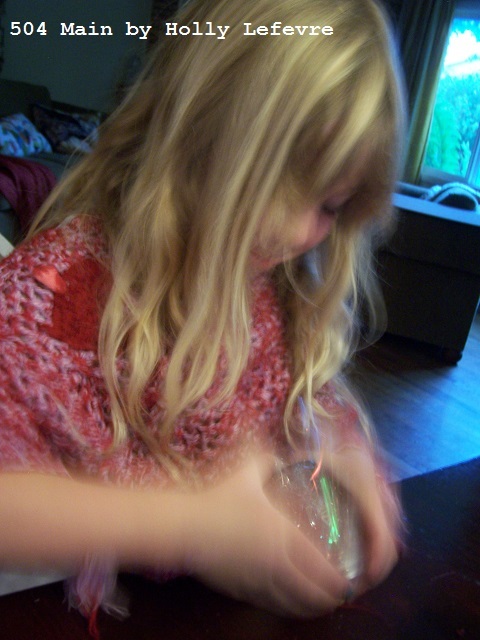 And believe it or not...in my overly-complicated world...this craft is pretty darn easy and quick! Small (or large jars). 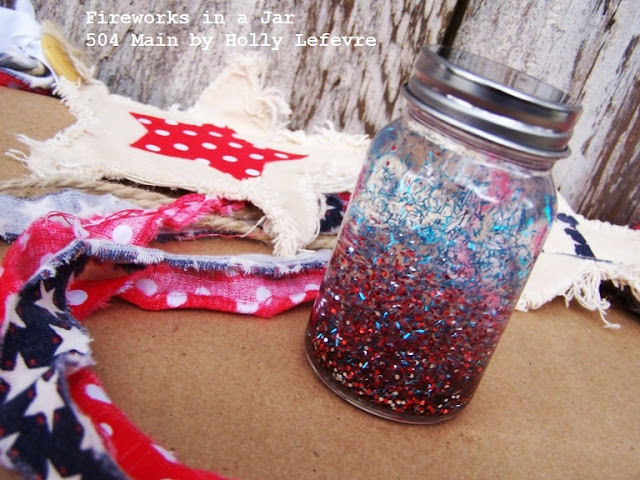 I used GLASS jars but you can also use PLASTIC jars for safety sake. I used small 4 oz. jars (from World Market) and a small half pint jelly jar. 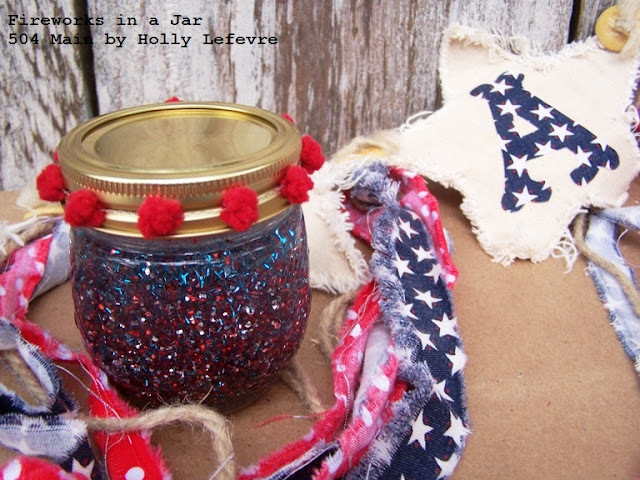 You can also just use any recycled jars from around the house. 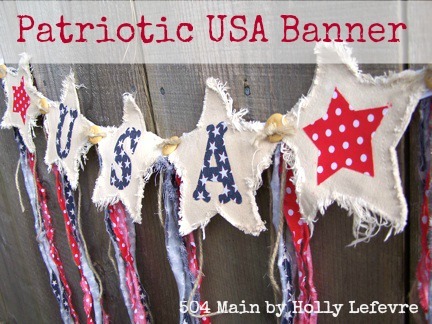 OR use a punch and cut stars (or whatever shape you wish) out of aluminum cans...I succumbed to my love of Diet Coke and purchased a 6 pack just for this project. You can also buy thin sheets of aluminum at craft and hardware stores. SAFETY FIRST: Gloves and heavy duty scissors or tin snips for the aluminum cans...if you choose do use that option. CAUTION: If you use the aluminum cans...the edges can be very sharp. wear gloves or be very careful when cutting your can apart. I did this (NOT THE KIDS) and I punched the shapes from the aluminum (NOT THE KIDS). OPTIONAL: If you are making your "fireworks" with a punch, do this now. Wash out your aluminum cans (and let dry). Use heavy duty scissors (I did use an old knife to puncture the can near the top) and cut around the top until it is off (remember sharp edges). Cut straight down toward the bottom and then cut the bottom off. Now you have a piece of aluminum. AGAIN CAUTION: If you use the aluminum cans...the edges can be very sharp. wear gloves or be very careful when cutting your can apart. I did this (NOT THE KIDS) and I punched the shapes from the aluminum (NOT THE KIDS). 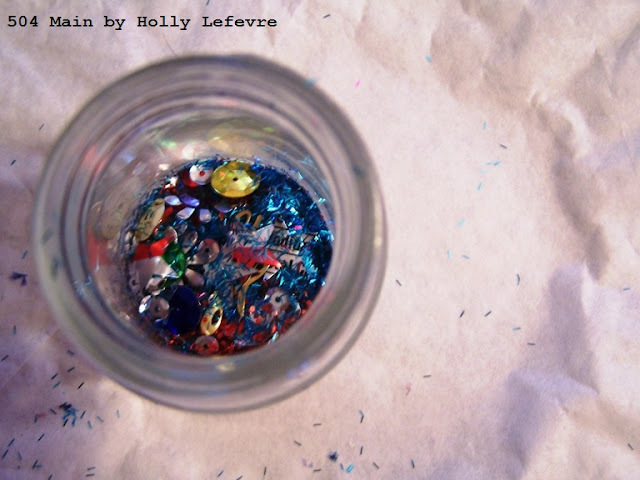 Place you stars, sequins, glitter into the empty glass jar. 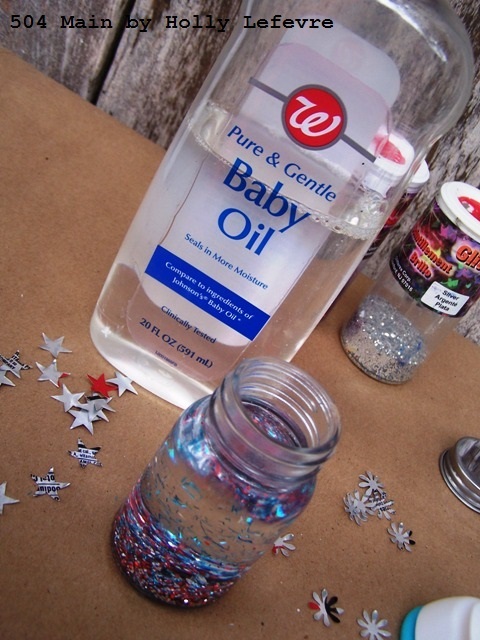 Fill the jar almost completely to the top with baby oil. Apply Gorilla Glue to the inside of the lid. Screw on the lid tight and let dry! so cute! great 4th project! love it and the banner! Happy 4th! This is the weekend I have my Parade Party, so maybe using this. P.S. Can't wait for you to get to Texas! So perfect! College Boy won't be home for the Fourth and I wanted to send him some stuff to celebrate and this is perfect! This is a great idea! My kids will love making these...I'm thinking about adding a glow in the dark element into the mix. Thanks Holly!! Love it! 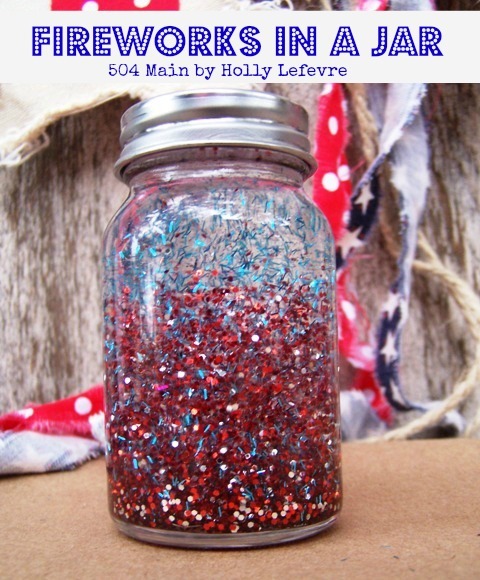 What an adorable, sparkly, and magical craft for the 4th! Such a fun idea! I love your banner too. That would keep me busy too - what a way to save the day! What a great idea! So fun for the kids! 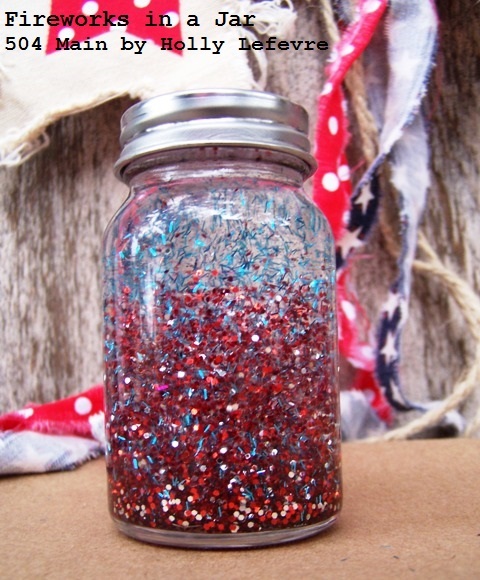 What a fun and easy craft idea! And Re; Austin, I know what you mean - another bloggy friend is headed there as well. :) Have a GRAND time there! Show Me Your Floss Face!